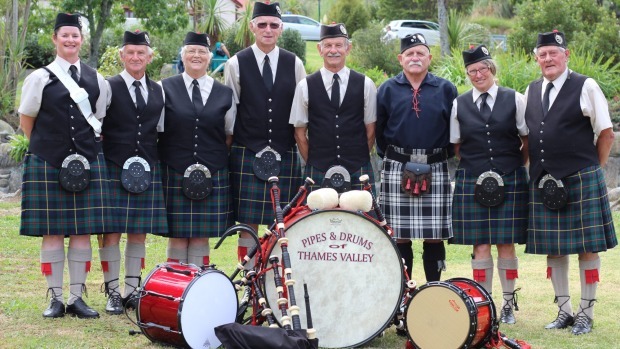 The Pipes and Drums of Thames Valley is a district Pipe Band which draws its members from the greater Thames Valley area: Thames, Thames Coast, Paeroa, Te Aroha, Waihi and the Hauraki Plains. The band is centred in Paeroa and holds its weekly practices on a Tuesday night, from 7pm to 9pm, in the Twentyman's Chapel, cnr of Arney St and Willoughby Streets. The hall is situated across the road from the Paeroa Domain. The band is keen to promote learners of the pipes and drums. Tuition is available. Enquiries can be made regarding tuition to the Pipe Major for piping or to the Drum Major for drumming. The pipe band parades at many different functions and events throughout the region: galas, civic parades, festivals, Christmas parades, etc. We also attend regular competitions with other bands from throughout the North Island, to firstly maintain and improve our playing standards and secondly, to provide the opportunity for our players to meet with other bands people. Pipe bands have a community focus and are rewarded because of this, however individual bandspeople participate for the enjoyment of learning the skills required and sharing in a fun and worthwhile activity.